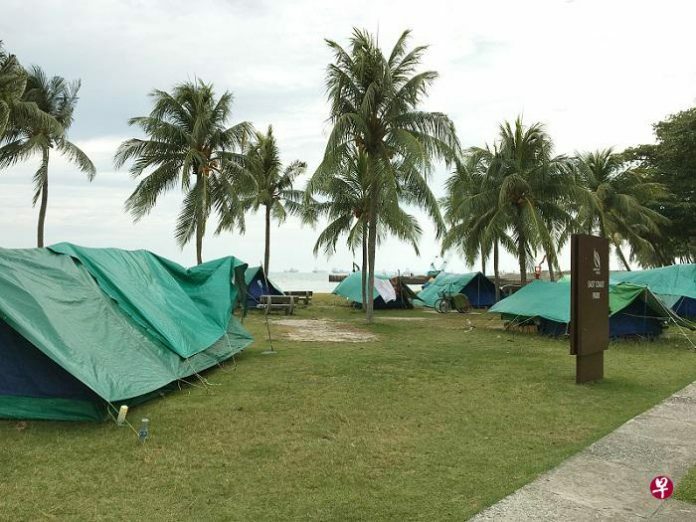 This trading port seems to be reliving its migrant past with the arrival in recent times of large numbers of traders, workers and students from China and India, both of which are linked historically with the island state since the days of Sir Stamford Raffles. In a way that is reminiscent of China’s earlier influx, Singapore is turning in a big way towards India to help pull itself out of its current economic rut. The ties go beyond immigrants and trade and investment, touching on a host of matters ranging from films and music to scholars, from politics and military cooperation to technology. Singapore: Monaco of the East! Cities reinvent and regenerate themselves constantly. At least, cities which thrive and beat the ravages of time to stay relevant are no strangers to change. 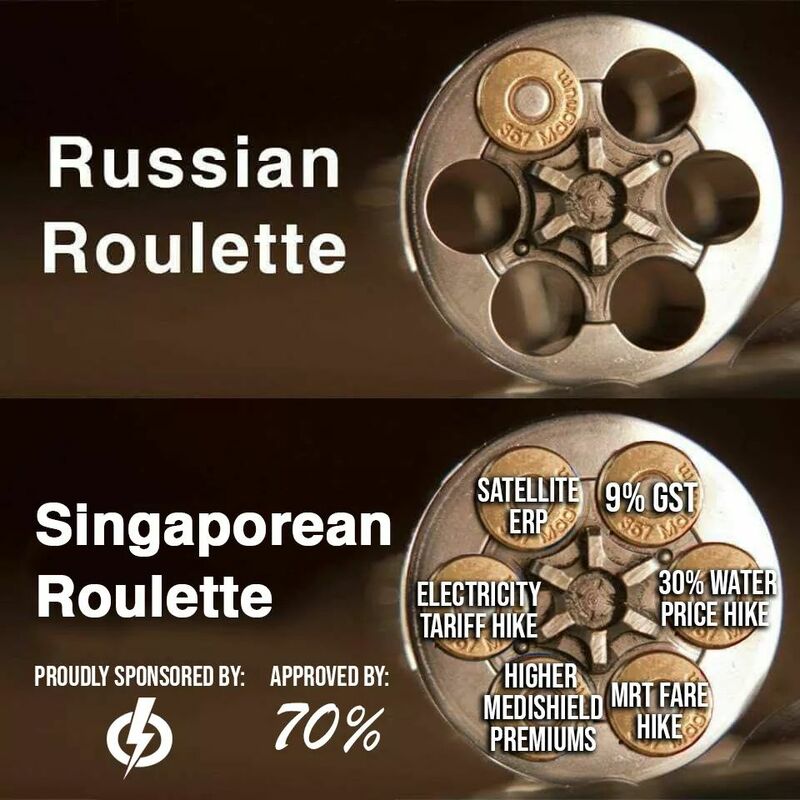 Singapore is no exception. During the last ten years, the city explicitly decided to shirk its 'Fine City' image, moving from being a sterile, gum free environment to a hip, happening urban setting. As is often the case, Singapore's policymakers succeeded ... perhaps too well for the city's own good. According to the World Economic Forum’s ‘Global Competitiveness Report 2009 ‐ 10’ Singapore’s public institutions are ranked as the best in the world (out of 133 countries studied); Singapore also has world ‐ class infrastructure (ranked 4th) , leading the world in the quality of its roads, ports and air transport facilities. In addition, the country's competitiveness is propped up by a strong focus on education, providing highly skilled individuals for the workforce. Its quality of education, particularly of its science and mathematics education, is considered the best in the world. The economic success of Singapore, and that of its public service, is strongly driven by a government heavily involved in a number of key sectors, such as housing, education and industry through its bureaucracy, adjudged one of the least corrupt in the world. What makes the Singapore government so effective, and how? What are the policy choices that Singapore has made, the institutional arrangements it has put in place, and the investment decisions that have allowed Singapore to be an island of excellence in the area of management and delivery of public services? How has it created an enabling environment that empowers public service institutions to cope with and manage change? How has the capacity of the civil service been developed and enhanced to remain at the cutting edge? We seek to highlight here the lessons and best practices on governance and service delivery from Singapore's public service experience, and analyse the links between the quality of civil service and national development, a subject that has remained relatively under-explored analytically. It was a leading question posed by a journalist to Daw Aung San Suu Kyi in her first visit to Singapore: what aspects of the Lion City might “The Lady” like to recreate in Myanmar? The question seemed fairly innocuous, albeit arguably loaded. The Nobel Peace Prize laureate dodged the bullet and fired a salvo of her own. “I don’t think ‘recreate’ is the word, ‘learn’ yes,” said Ms Suu Kyi. Singapore’s “work-oriented” education system, for example, leaves something to be desired. It's midnight on a Saturday night at the Marina Bay Sands resort near the sparkling Singapore River, and all the boutiques are shut. But past a cosmetic-surgery clinic and a Ferrari accessories store close by, a large crowd is getting increasingly agitated. Dozens of hopefuls are clamoring to get in to what is billed as the world's most expensive club, Pangaea. Tight-fitting Herve Leger bandage dresses are practically a uniform here, often paired with Christian Louboutin heels and Chanel 2.55 bags, as women try to befriend club goers who are lucky enough to get past the red-velvet barrier and bouncers. It is frequently the leggy models, part of the club's core demographic, who succeed. Out-of-town visitors who negotiated their way onto the guest list weeks earlier are turned away, even after offering to pay more than $3,000 for a table. The nightclub is completely full. Past the bouncers, a walk through a long tunnel with blue ultraviolet lights and a ride up an elevator reveal one of the world's most exclusive parties. Michael Ault, Pangaea's founder, sits at the club's most prestigious table by the bar, on cushions covered in exotic African ostrich skins. His table is covered with bottles of Belvedere vodka, Cristal champagne, buckets of ice and dozens of glasses for his friends. His wife, Sabrina Ault, a former fashion model and now his business partner, wears a fake shark's head and wields a plastic gun while dancing on a table top. At Pangaea, all surfaces are made for dancing—even tables made from the trunks of 1,000-year-old trees and the crocodile-skinned couches. It seems like Singapore’s billion-dollar green investments have paid off. A new study says that the city-state is Asia’s most livable city, beating regional rivals like Hong Kong, which now has one of the worst levels of air pollution in the world. According to ECA International, the group which conducted the study, Singapore is the best city globally for Asian expatriates. Hong Kong jumped three places, overtaking Tokyo and Yokohama this year on quality-of-life indicators, but it did so only because the two Japanese cities were affected by last year’s earthquake and nuclear disaster in northeast Japan, says ECA International. Among the 49 Asian cities covered by the group’s study, Hong Kong now ranks third in livability, just behind Singapore and the Japanese city of Kobe. Hong Kong’s excellent schooling, vibrant nightlife and transport systems are often seen as comparable — or better than — its Southeast Asian rivals, sometimes coming out tops in the Singapore-Hong Kong debate. 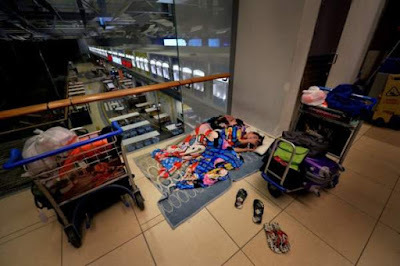 Millionaires in Singapore – A Success Story? Singapore has been making headlines recently as the country with the highest proportion of millionaires. Is it something we should be proud of? 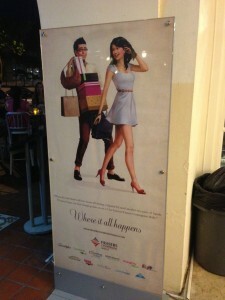 Is it an advert for the economic success story that is Singapore? It is worth talking about this briefly as it says something important about how the world sees us. On the surface we appear to have a small government and rich citizens and many observers, particularly the right-wing and libertarian segments of the American population, see us as having the best government in the world. Of course, this point of view is ridiculous, we have neither small government nor, for the most part, rich citizens. 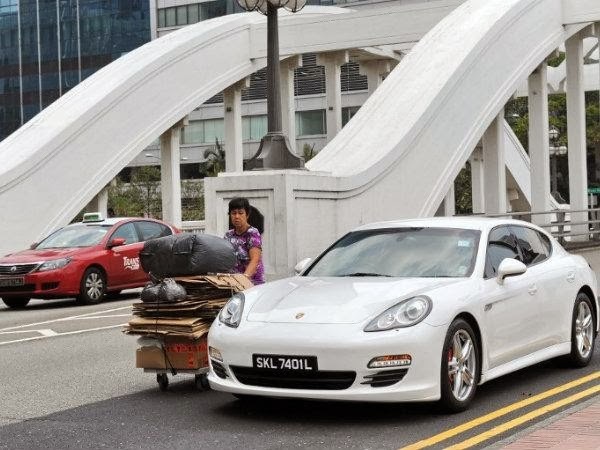 So let us ask, should Singapore be proud of having the most millionaires in the world? Is our high density of ultra-wealthy residents indicative of the quality of our government’s economic policies? To shed light on the matter, let’s look at the most recent article to put this theory into writing – “Wealth Over the Edge: Singapore” in the Wall Street Journal. 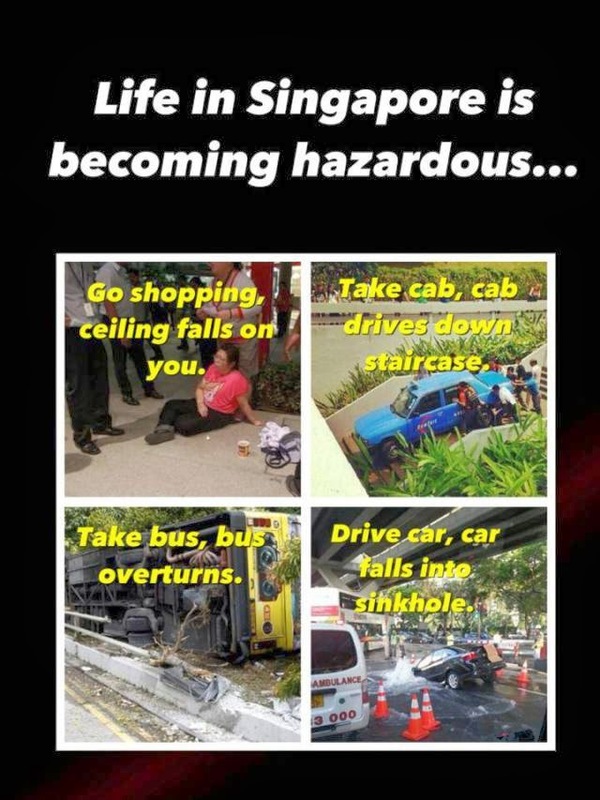 It mentions many million or even billionaires living in Singapore. For each of the people mentioned, I copy below how they are described. A mansion in the heart of Singapore’s central shopping district has just gone on the market – for the low, low price of $242 million. The 85,000-square-foot site lies just near the city’s Botanic Gardens, next to the city state’s main shopping district, Orchard Road. Included in the price is a two-story home, swimming pool and tennis court. The house is also next door to the Russian and Japanese embassies and a few streets away from the home of the British high commissioner. The property is being sold by a holding company belonging to Cheng Wai Keung, chairman of the Hong Kong property developer Wing Tai Holdings. Australian retail and property magnate Brett Blundy is the latest tycoon to be moving to Singapore, according to The Wall Street Journal. The US publication said on Tuesday it was informed by “people with knowledge of the situation” that the 53-year-old and his wife, Vanessa, have made Singapore their new home. Talks about his anticipated move began late last year when the Blundy family decided to sell off their exclusive Vaucluse compound in November as well as their “two-level penthouse”,according to Australia’s Property Observer. The Australian retail and property businessman is ranked number 33 in Forbes list of Australia’s richest with a net worth of US$ 835 million (SGD$1 billion). Why is Facebook co-founder now in Singapore? Singapore is eager to attract wealthy investors like Saverin, and offers plenty of tax incentives and even permanent residency for big investors. Angel investors in local start-ups enjoy reduced income tax -- and in some cases, pay no income tax. Saverin has invested in a few Singapore mobile app companies, including Anideo and Perx, which has an increasingly visible customer loyalty reward program in Singapore. Still Singapore is a good place to live if you are seeking privacy. Most of the media is government backed and keeps a fairly tight lid on private lives, and while the internet has plenty of gossip, Saverin won't likely find paparazzi chasing him in Singapore. Headhunters in Singapore have spotted a new trend – the rise of the opportunistic expat. The term refers to a foreigner who arrives without a job or a relocation package in the hope of finding work in a booming economy. While there are no hard or fast figures available, recruitment firms across the city have seen a marked increase in opportunistic expats. Swiss bank accounts look set to be emptied in favour of more preferable Singapore (Getty). The report from private banking research group WealthInsight takes a deep dive into where money is moving in the most exclusive investment clubs in the world - in elite wealth management, family and multi-family offices. In 2011 it was a $18.80 trillion industry. Switzerland had $2.9 trillion of that money. That's 34 percent of the pie, and more than anywhere else in the world. But that's changing, and fast. Partly because governments have been scrutinising traditional private banking centres like Luxembourg and the Caribbean lately, so the rich are looking for quieter places to base their cash. Enter Singapore, a quick plane ride for Asia's wealthiest with a well-regulated banking sector. It also has a head start in the private banking. Singapore-based Portcullis TrustNet, for one, was mentioned in a recent International Consortium of Investigative Journalists report about how the super rich invest in tax havens with the help of talented private bankers. Thanks in part to its generous tax regime, Singapore has been a millionaire haven for years. But a new report says the tiny island state may soon overtake Switzerland as the world's largest offshore wealth hub. Newly rich in countries like China and Indonesia are contributing to this move as well. Most emerging markets have a growing number of rich people, but lack the banking structure to service them. In 2011 Singapore had $US550 billion worth of private banking assets under management, in 2000 it had only $US50 billion. That's massive growth that WealthInsight doesn't see that slowing any time soon. Tax incentives: Tax rates that max out at 20 percent and no capital gains taxes, according to Reuters. Foreign cash: Reuters reported that estimates put "the amount of German money moving to Singapore in the double-digit billions," forcing the German government to step in and negotiate more transparent banking standards. Tax burden on poor - For a poor man earning $2000, he is not going to be able to retire and withdraw anything meaningfully from CPF due to minimum sum requirement and inflation. Just as the some economist view social security contribution as taxation, we assume that CPF is a form of tax. Loving our country too much? Things are getting ugly online again. Read almost anything that has to do with immigration, population, jobs, housing, transport or any current socio-political issue and you’re likely to stumble upon some anti-foreigner comment, sometimes expressed in a most offensive way. We know what triggered this wave of xenophobia—government policies that have led to a sudden population increase fuelled by mass immigration, infrastructure that used to comfortably support us now bursting at the seams, rising cost of living, wages that can’t keep up, the widening gap between the haves and have-nots … this list is now a well rehearsed litany. But I think the roots of the xenophobia we see now go further back. I think they sank their feelers into the ground in the nationalism that was laid down as the bedrock of modern Singapore society decades ago. By 2020 Switzerland will have lost its position as the number one destination for the wealth of the world's super rich to Singapore, a report says. The report from private banking research group WealthInsight takes a deep dive into where money is moving in the most exclusive investment clubs in the world - in elite wealth management, family and multi-family offices. In 2011 it was a $US19.3 trillion ($A18.80 trillion) industry. Switzerland had $US2.8 trillion of that money. That's 34 per cent of the pie, and more than anywhere else in the world. No Longer A Sure Thing For Investors? Lee Kuan Yew, the controversial founding father of Singapore, may have summed up his country's history best when he entitled his memoirs From Third World to First: The Singapore Story. However, there is more than one version of the Singapore story - something investors in the iShares MSCI Singapore Index Fund ETF (EWS), the iShares MSCI Singapore Small Cap Index Fund (EWSS) and The Singapore Fund (SGF), the main investment options American investors have for investing in Singapore or in the Southeast Asian equities listed there, need to be aware of. These other versions of the Singapore story includes one that says the country was destined to succeed in the past simply because of its strategic location, deep water port and "one degree more" efficiency in an otherwise bad neighborhood filled with mismanagement, corruption and political uncertainty. Then there is a recently written post (or rather a lengthy rant) which has attracted wide attention online because it was written by an anonymous European working in Singapore and he or she goes into considerable detail to describe so-called "Singaporean retardation" or "stupidity." Finally, Singaporeans themselves are growing increasingly restless over their country's high cost of living, the presence of large numbers of foreign workers and corruption scandals - which could spell trouble for the long-ruling People's Action Party (PAP) in the 2016 general elections and impact the iShares MSCI Singapore Index Fund ETF, the iShares MSCI Singapore Small Cap Index Fund and The Singapore Fund. Singapore, one of Asia's largest financial centers, has seen a big inflow of expatriates in recent years. Now, as a sharp rise in the cost of living threatens high living standards, the city-state may well be at risk of becoming a victim of its own success. Foreigners make up about 38 percent of Singapore's population, up from about 25 percent in 2000. More than 7,000 multinational companies operate in the city and expat workers are seen as key to developing Singapore, not just as a regional hub in finance but also in other sectors such as oil and gas. Weak exports and a slowdown in the manufacturing sector hurt Singapore's economy last year, with the economy just avoiding a recession in the final three months of 2012. The Southeast Asian city-state of Singapore may boast of the highest percentage of millionaires in the world, but retiring in this wealthy financial hub is becoming even more difficult for the common man. According to a latest study by HSBC, the citizens of this country, which has one of the highest per capita incomes in the world, face the grim prospect of running out of their savings almost halfway through retirement as the high cost of living and increased life expectancy eats into their nest egg. Singapore has gradually moved up human resources firm Mercer's global rankings of the world's most expensive cities, moving to sixth place in 2012 from eighth in 2011 and eleventh in 2010. From designing the decor to drawing up the dessert menu, Venezuelan national Carlina Maldonado and her husband spent months preparing for the launch of their new restaurant venture in the Asian financial hub of Singapore. But as the opening day approached, there was just one thing missing: staff to serve their South American fare. Hiring challenges, stemming from the government's tighter controls on foreign labor, postponed the launch of their restaurant, Sur, by a month – an expensive delay that left them with a high rental bill and zero income. "We had an overwhelming response to the job ads we posted online, but 99 percent of the applications were from non-Singaporeans, mostly Filipinos. They were extremely qualified but we couldn't employ them because of the hiring restrictions," 33-year-old Maldonado, a former bartender, told CNBC. Singapore expects housing and transport costs to drive increases in consumer prices this year, a government minister said Monday. The government for now still expects consumer price inflation to come in at 3.5%-4.5% this year, after the CPI index averaged a 4.2% increase from a year earlier in January and February, Second Minister for Trade and Industry S. Iswaran told Parliament. His comments come ahead of the Monetary Authority of Singapore's semiannual policy review this week. The central bank is due to issue its monetary-policy statement on Friday, when it is widely expected to keep its existing stance of guiding the Singapore dollar gradually higher. Singapore's citizens are the biggest threat to national growth, said analysts at Goldman Sachs at an annual wealth conference yesterday, held in Marina Bay Sands. "Let's be honest here. Does Singapore need Singaporeans? No. The children are taken care off by foreign domestic helpers, the hawkers are Malaysian (PRC Chinese), the buildings are constructed by Bangladeshis. All Singaporeans are good for are populating the army, which has never gone to war!" said emerging markets specialist, Thomas Money. I greatly enjoyed reading the Single Dude’s articles on the pros and cons of Singapore. As a European business person I would like to expand a bit on the “Singaporean retardation” described in the cons article. When I arrived in Singapore I was absolutely shocked at the almost unimaginable retardation of the local Singaporeans. Given that Singapore is one of the wealthiest countries in the world and apparently has the highest number of millionaires per capita, I was expecting to find a mecca of high technology and efficiency but I was sorely disappointed. It’s true the center of the city is full of modern looking buildings and is very clean but aside from that Singapore has much more in common with “third world” countries than it does with it’s very “first world” image. Let me preface the anecdotes I’m about to tell by stating that the situations I’m about to describe are very much “business as usual” in Singapore and not extraordinary in any way shape or form. These are daily occurrences, not once in a month or once in a year occurrences. Also, please remember that Singapore claims to be an English speaking country, but as you will soon find out, that is a very unsubstantiated claim. WE SEE THE PROSPEROUS AND ETHICAL SINGAPORE. to the various people who have sent me photos, captions, videos, etc., thanks! Keep them coming! So many of the world’s rich and famous have moved here, as permanent residents or new citizens. Facebook co-founder Eduardo Saverin. Australian mining tycoon Nathan Tinkler. India telco tycoon Bhupendra Kumar Modi. New Zealand billionaire Richard Chandler. US investor Jim Rogers, who set up shop there in 2007. Indonesian-born millionaire Frank Cintamani. According to the article, Gina Rinehart, one of the world’s richest women, slapped down $46.3 million for a pair of Singapore condominium units last year. Gosh! And we gasp at $1m price tag for an executive condo! I guess we should be glad that we are such a playground, an Asian Monaco. Hopefully, these rich people-turned-PRs, or PRs- turned-new citizens will leave some business or money behind to filter to the rest of us. That they wouldn’t keep their wherewithal to themselves, but would put what they can into a country that provides them with better comforts than their own home country. Wealth-X, a private consultancy that provides intelligence on the world’s uber-rich, estimates some 1,400 ultra-high-net-worth individuals now hold more than $160 billion of wealth in Singapore, reported WSJ. 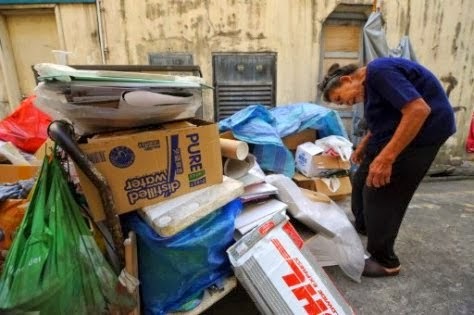 How do Singapore's poor families get by? Are Singapore's poor better off? A documentary film on Singapore political exiles who fled the country has been given a "Not Allowed for All Ratings" classification because its contents "undermine national security", the Media Development Authority said in a statement on Wednesday. 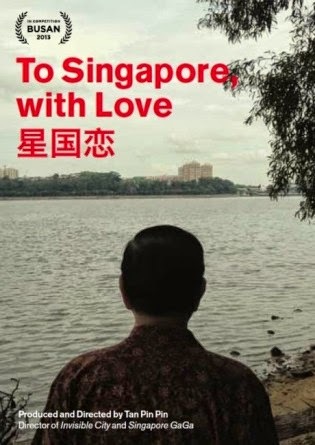 is means the documentary, To Singapore, With Love, by award-winning filmmaker Tan Pin Pin, cannot be exhibited or distributed here. Ms Tan's documentary explores the lives of Singaporeans living in exile - some for as long as 50 years - in places like London and Thailand. It was submitted for classification in May by the National University of Singapore Museum. My earliest and most vivid recollection is of being held by my ears over a well in the compound of a house where my family was then living, at what is now Tembeling Road in Singapore. I was about four years old. I had been mischievous and had messed up an expensive jar of my father's 4711 pale-green scented brilliantine. My father had a violent temper, but that evening his rage went through the roof. He took me by the scruff of the neck from the house to this well and held me over it. How could my ears have been so tough that they were not ripped off, dropping me into that well? Fifty years later, in the 1970s, I read in Scientific American an article explaining how pain and shock release neuropeptides in the brain, stamping the new experience into the brain cells and thus ensuring that the experience would be remembered for a long time afterwards. I was born in Singapore on 16 September 1923 in a large two-story bungalow at 92 Kampong Java Road. My mother, Chua Jim Neo, was then 16 years old. My father, Lee Chin Koon, was 20. Their parents had arranged the marriage a year previously. Both families must have thought it an excellent match, for they later married my father's younger sister to my mother's younger brother. The radio talks that Singapore's founding Prime Minister Lee Kuan Yew gave were a crucial move in winning the hearts and minds of the people. Prime Minister Lee Hsien Loong said this in a Facebook post on Saturday (Oct 11), after visiting the Battle for Merger exhibition at the National Library. The exhibition showcases the compilation of the 12 radio talks first published in 1962, that has now been reprinted. Mr Lee said the radio talks led to Singapore joining Malaysia, then separation and today's independent Singapore. It told the inside story of the fight between the non-Communists and Communists, and explaining to Singaporeans what was at stake. He said had Mr Lee Kuan Yew and the non-Communist side lost, Singapore's history would have been totally different. 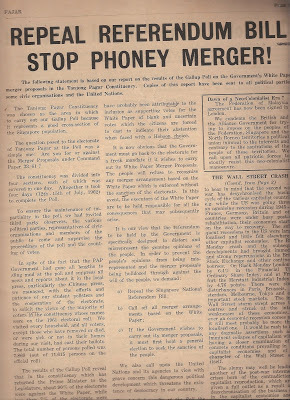 "Therefore, let us be clear in our minds that the Government is under no compulsion to have this referendum and there is no necessity to resort to trickery…The final position which we want to achieve is not just merger, but a merger under which the various races in Malaya will live in peace and harmony. …It is the duty of the Government to try and bring merger and Malaysia about peacefully by consent with the maximum of goodwill and of give and take." 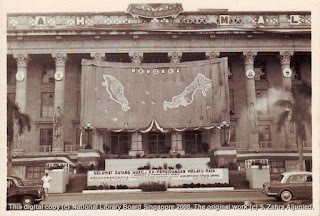 Malayan Prime Minster Tunku Abdul Rahman’s historic announcement on 27 May 1961 proposing the possibility of Singapore’s merger with the Federation of Malaya was welcomed by the Singapore government and moderates in the People’s Action Party (PAP). However, it caused consternation among the PAP pro-communist and non-communist factions and precipitated an open confrontation between the moderates and pro-communists in the PAP over merger. The pro-communists dreaded the prospect of Singapore coming under the control of the anti-communist government in Kuala Lumpur who would then crack down on the leftists in Singapore. The open confrontation caused the pro-communist faction to break from the PAP in July 1961 and form the Barisan Sosialis. Thus began the battle for merger between the PAP and Barisan Sosialis – a battle to win the hearts and minds of the people for the future of Singapore. The terms of merger as agreed between the Singapore and Malayan governments were made official with the release of the White Paper in November 1961. The Barisan opposed the government’s approach to merger, criticising in particular the restrictive citizenship stipulations. Then Prime Minister Lee Kuan Yew responded with a series of radio broadcasts to convince the people of merger and why the pro-communists were out to sabotage the union. The government also decided to submit the question of merger to a popular referendum, presenting three alternative forms of merger. Known as the National Referendum of 1962, it was a constitutional process to decide on the “mode and manner” of Singapore’s unification with Malaya. 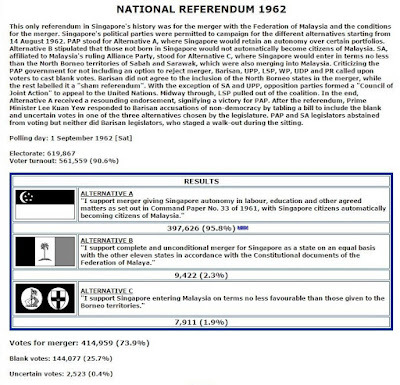 The referendum on merger with the Federation of Malaysia, also known as the Singapore National Referendum, was held on 1 September 1962. The idea for a referendum to be held was championed by then Prime Minister Lee Kuan Yew of the People’s Action Party (PAP). 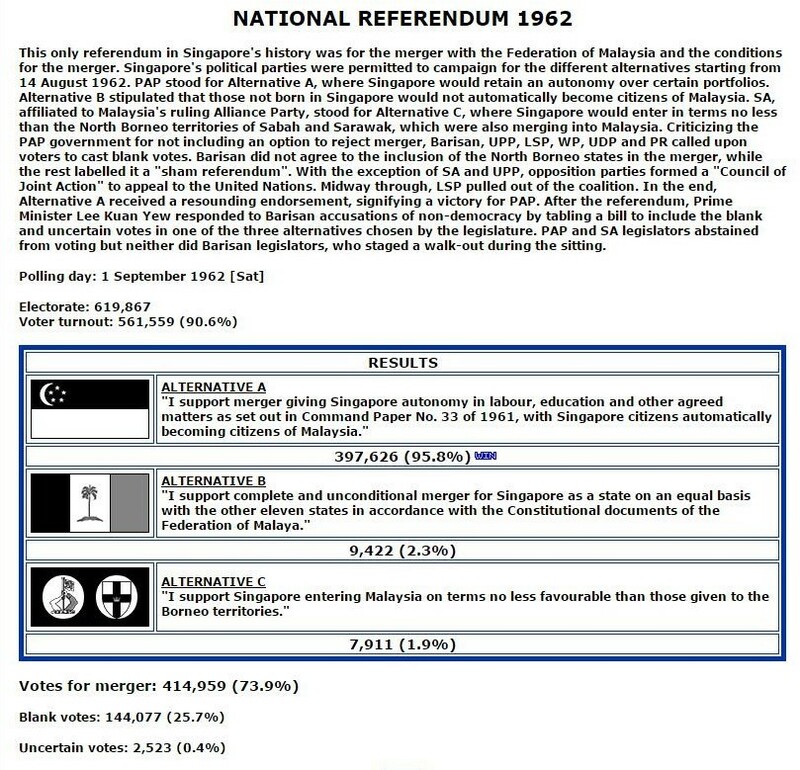 The official purpose of the referendum was to allow the people of Singapore to express their preference on the terms of merger with Malaysia. The opposition political parties, notably the Barisan Sosialis (BS), were not satisfied with the framing of the referendum as it did not allow voters the choice of rejecting merger altogether. Despite such dissatisfactions, the referendum was carried out with three contentious options for merger being offered to voters. During the referendum, the flags of Singapore, Penang, Sarawak and North Borneo were each attached to one of the three options. Alternative A carried the Singapore flag, alternative B the Penang flag, and alternative C had the Sarawak and North Borneo flags. 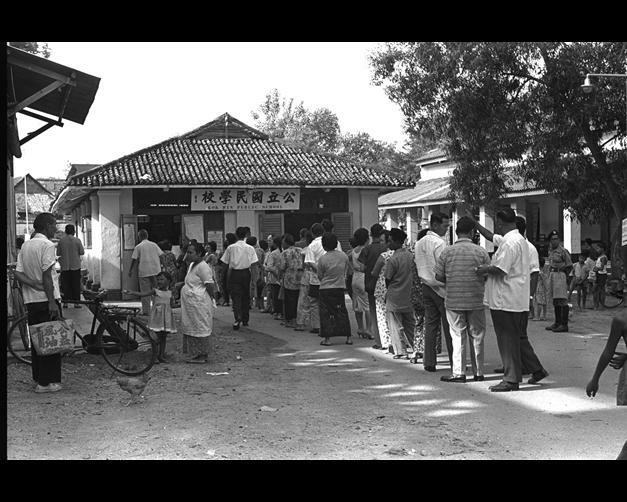 Polling started at 8:00 a.m. on 1 September 1961 and ended at 8:00 p.m. the same day at all 345 polling stations. Voting was made compulsory and 90 percent or 561,559 of the 624,000 registered citizens turned up to vote. At 6:45 a.m. the following day, just before the results were announced, Dr Lee demanded a recount. The recount made no difference to the results and Dr Lee responded by calling it a “sham referendum” with results that “[did] not reflect the will of the people”. The results of the referendum were only announced in the early hours of 2 September 1962. Of a total of 417,482 marked ballot papers, 397,626 (70.8 percent of voter turnout) had voted for alternative A. Alternative B garnered only 9,422 votes (1.7 percent), and alternative C got 7,911 votes (1.4 percent). Blank votes totalled 144,077 (25.7 percent). The rest of the “uncertain” votes amounted to 2,370 (0.4 percent). Nearly 50 percent of Jurong’s voters, a BS stronghold, were found to have cast blank votes. Gallup Poll: If 1962 referendum was Yes-No vote, 90% would have voted against merger. Many Singaporeans just like Bertha Henson, a veteran journalist would be surprised by the relevation that the people of Singapore were presented with a poll to vote for merger with no choice of saying "No". We all know what have been taught to us in school. In 1962, we voted overwhelmingly in favor of merger. In 1965, we got kicked out and the rest, as they say, is history. However, did we actually vote overwhelmingly in favor of referendum? In fact, did we even have a choice to vote against referendum? Option A: All Singapore citizens would automatically become citizens of Malaysia, and Singapore would retain a degree of autonomy and state power, such as over labour and education. Singapore would also get to keep its language policies, such as to retain using all four major languages: English, Mandarin Chinese, Malay and Tamil. Option B: Singapore would become a federal state like that of the other eleven states of Malaysia, with no more autonomy than the others, thus ceding control over issues such as labour and education policies to the central (federal) government in Kuala Lumpur. This also meant that there would be less multilingualism - only English and Malay would be used for official purposes, and possibly education. Only those born in Singapore or descended from the Singapore-born would become citizens of Malaysia. There would also be proportionate representation in the federal Parliament from Singapore. Option C: Singapore would enter on terms no less favourable than the Borneo territories, Sabah and Sarawak, both whom were also discussing merger with Malaysia. This was to ensure that Malaysia would not discriminate along racial lines, as that would mean discriminating against Sabah and Sarawak, which were predominantly Bumiputra as well. Option A received the majority of the vote at 73%, more then the two-thirds required for constitutional reform. The pro-communist Barisan Sosialis was strongly against the idea of a referendum, as they thought it would result in their suppression. The Barisan Socialis called for a boycott of the referendum, telling their supporters to submit blank votes in protest against the "rigged" referendum. 26% of the vote were left blank as a result. This move had been anticipated by the ruling PAP government, which therefore inserted a clause stating that all blank or defaced votes would be counted as a vote for option A. The media campaign fielded by both sides was extremely heated, and many of the leaders on both sides broadcast radio shows in several languages. The voter turnout was extensive: around 624,000 were eligible to vote, and around 561,000 voters turned up, a turnout of 90%. The first internal challenge to merger with the Federation of Malaya came from and grew out of a political struggle between the People's Action Party (PAP) and their opponents included the Barisan Sosialis (Socialist Front), the Liberal-Socialist Party, the Workers’ Party, the United People’s Party and the Partai Rakyat (People’s Party). In Singapore, the PAP sought formation of Malaysia on the basis of the strong mandate it obtained during the general elections of 1959 when PAP won 43 of the 51 seats. However, this mandate became questionable when dissension within the party led to a split. In July 1961, following a debate on a vote of confidence in the government, 13 PAP Assemblymen were expelled from the PAP for abstaining to form a new political party, the Barisan Sosialis or the Barisan have consequences the PAP's majority in the Legislative Assembly was whittled down as they now only commanded 26 of the 51 seats. The ruling PAP was not legally obliged to call for a referendum, but did so to secure the mandate of the people. 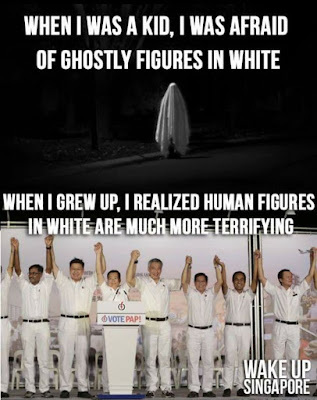 However, the Barisan Sosialis, a left-wing socialist party consisting of former PAP members with communist sympathies pedigree to the opposition to the colonialism, and imperialism movements were alleged that the people did not support merger, but Lee Kuan Yew declared that people did. The referendum did not have an option of objecting to the idea of merger because no one had legitimately raised the issue in the Legislative Assembly before then. However, the methods had been debatable. The referendum was therefore called to resolve the issue as an effort to decide objectively which option the people backed. 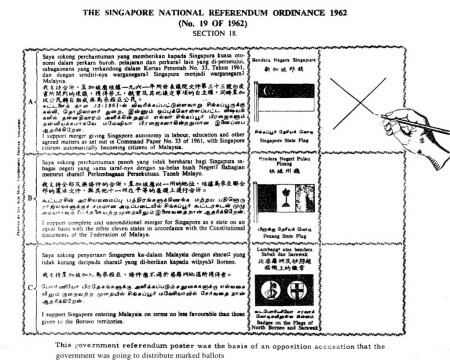 The legitimacy of the referendum was often challenged by Singaporean left-wingers, due to the lack of an option to vote against the merger. The Singapore story is based on facts and documents, and the consensus of historians who have studied them. Since these facts and documents are all on record, any dispute can be resolved impartially and objectively. It is objective history, seen from a Singaporean point of view. The facts of the Singapore story will always be subject to reinterpretation in the light of new information or fresh analysis, like all other historical facts. But this should not pose any special problem in teaching National Education. Schools have always taught history. Historians have always drawn lessons from historical events - that is the whole point of studying history. Historical controversy and creativity must be consistent with the facts. Facts will not and cannot be ignored, however inconvenient. 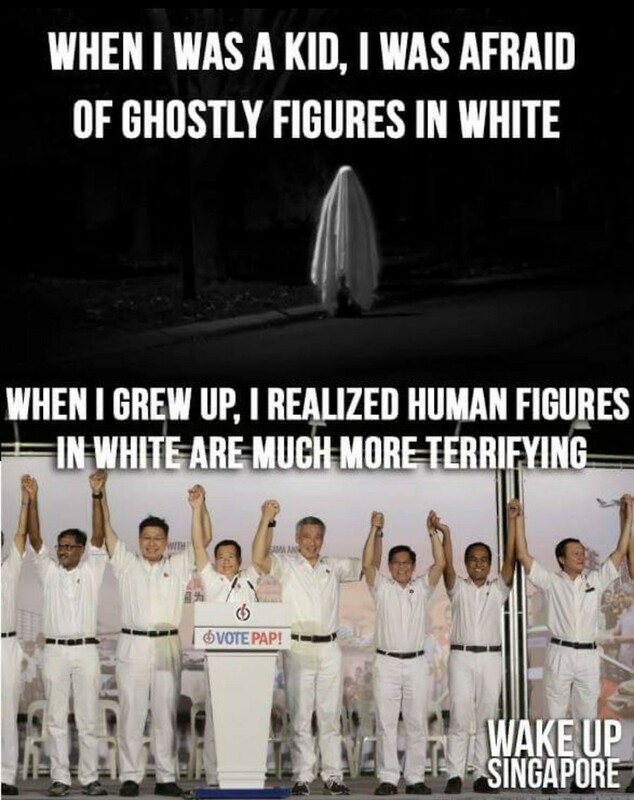 Man in White : Silence on key issues..
Option A: All Singapore citizens would automatically become citizens of Malaysia, and Singapore would retain a degree of autonomy and state power, such as over labour and education. Singapore would also get to keep its language policies, such as to retain using all four major languages, English, Mandarin, Malay and Tamil. 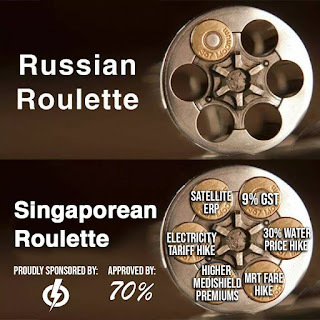 Option B: Singapore would become a federal state like that of the other eleven states, with no more autonomy than the other states would, thus ceding control over issues such as labour and education policies to the federal government in Kuala Lumpur. This also meant that there would be less multilingualism - only English and Malay would be used for official purposes, and possibly education. Only those born in Singapore or descended from the Singapore-born would become citizens of Malaysia. There would also be proportionate representation in Parliament from Singapore. Option C: Singapore would enter on terms no less favorable than the Borneo territories, Sabah and Sarawak, both whom were also discussing merger with Malaysia. This was to ensure that Malaysia would not discriminate along racial lines, as that would mean discriminating against Sabah and Sarawak, which were predominantly Bumiputra as well. Many consider the referendum to be undemocratic - the PAP had all its bases covered because blank votes were counted as option A[Wikipedia] . Isn't that interesting history of how a false undemocratic choice was presented to the people? Following the referendum, the PAP declared it had strong support for merger. This only referendum in Singapore's history was for the merger with the Federation of Malaysia and the conditions for the merger. 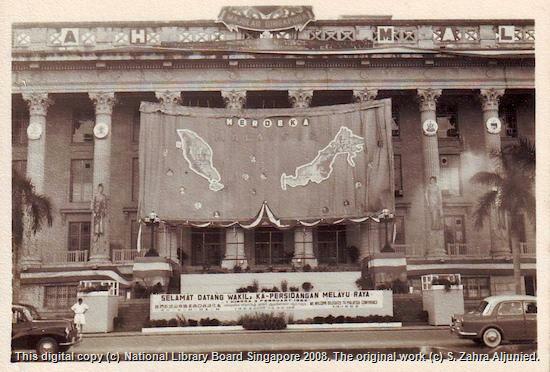 Singapore's political parties were permitted to campaign for the different alternatives starting from 14 August 1962. 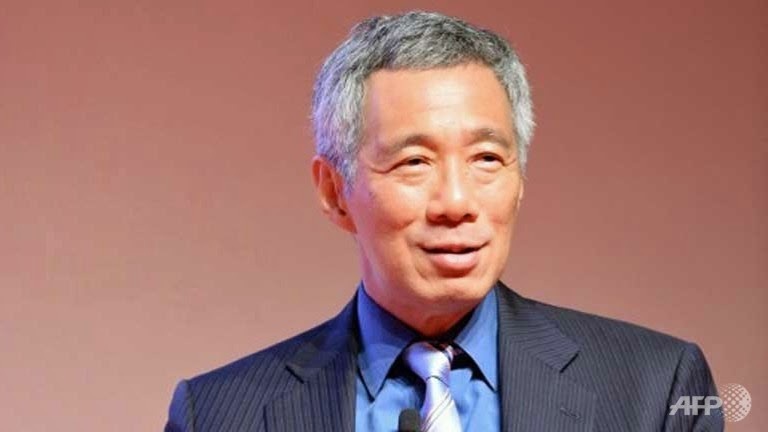 PAP stood for Alternative A, where Singapore would retain an autonomy over certain portfolios. Alternative B stipulated that those not born in Singapore would not automatically become citizens of Malaysia. SA, affiliated to Malaysia's ruling Alliance Party, stood for Alternative C, where Singapore would enter in terms no less than the North Borneo territories of Sabah and Sarawak, which were also merging into Malaysia. Criticizing the PAP government for not including an option to reject merger, Barisan, UPP, LSP, WP, UDP and PR called upon voters to cast blank votes. Barisan did not agree to the inclusion of the North Borneo states in the merger, while the rest labelled it a "sham referendum". With the exception of SA and UPP, opposition parties formed a "Council of Joint Action" to appeal to the United Nations. Midway through, LSP pulled out of the coalition. In the end, Alternative A received a resounding endorsement, signifying a victory for PAP. 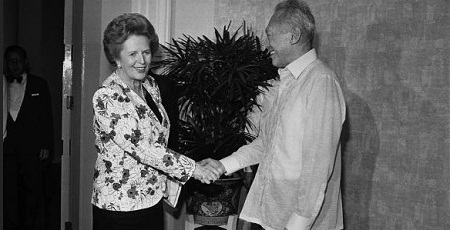 After the referendum, Prime Minister Lee Kuan Yew responded to Barisan accusations of non-democracy by tabling a bill to include the blank and uncertain votes in one of the three alternatives chosen by the legislature. PAP and SA legislators abstained from voting but neither did Barisan legislators, who staged a walk-out during the sitting.